Solo wa s a stunning black toy who combined outstanding conformation, style and personality. 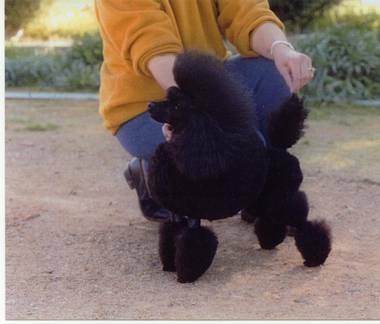 A brilliant show dog and wonderful companion, his impact was made as a sire. He currently has sired 10 Aust Champions . His brother Aust Ch Vivara Dare to Dream (CC) is also the sire of 5 Aust Champions. May he rest in peace and run free forever with Gigi and the other standards at " The Bridge". Many thanks to Carol Vimpany ( Vivara) www.vivarapoodles.com for allowing me to have such a beautiful boys as Solo & CC and for her ongoing support and friendship.